Details of Subjectwise Doubt solving helpline. That I've gained from JKSC is a strong base, ignited interest & clear concepts. The faculty all through P E - I, P E - II & Final were excellent. Also, it wouldn't be fair to skip a mention about the study material of JKSC. There is no doubt that it is the best & most comprehensive study material that help one face any question in the exam. Last, but not the least, J. K. Sir's guidance helped to start studying early & believing a rank is possible. 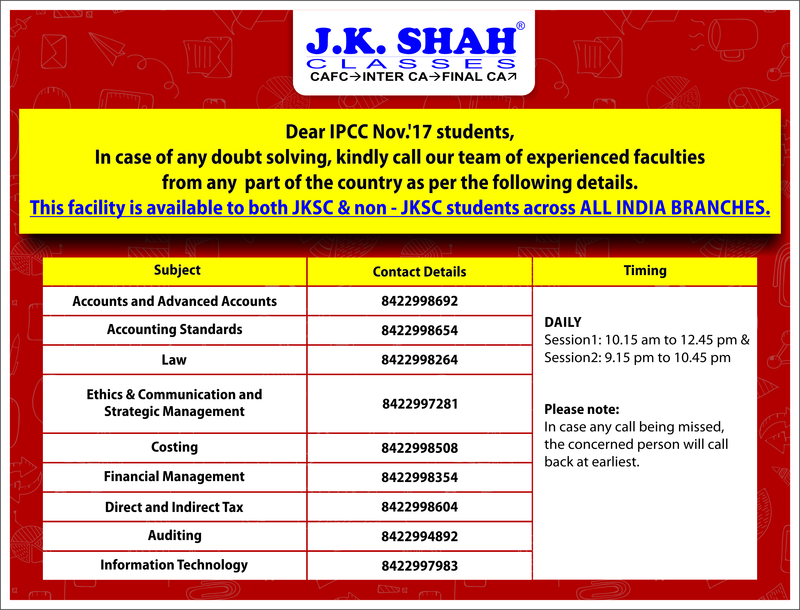 Jk Shah is the Best CA Coaching in India providing classes for CA CPT, CA IPCC, CA Final & CS. We have offices in Mumbai,Rajkot,Surat,Vadodara,Veraval,Kolkata,Junagadh,Jamnagar,Jaipur,Indore,Hyderabad,Coimbatore,Chennai,Bengaluru & Ahmedabad. If you think you are great with numbers and possess a sharp memory, then become a Chartered Accountant (CA), one of the leading professions in India. We have been training aspiring students in Hyderabad, Mumbai and Chennai for the past 34 years. To become a prestigious member of the Institute of Chartered Accountants in India (ICAI) is a lengthy, vigorous and strenuous process, spanning over 3-5 years. J. K. Shah Classes promise to be with you on every step along the way, from start to the end of the CA Coaching. 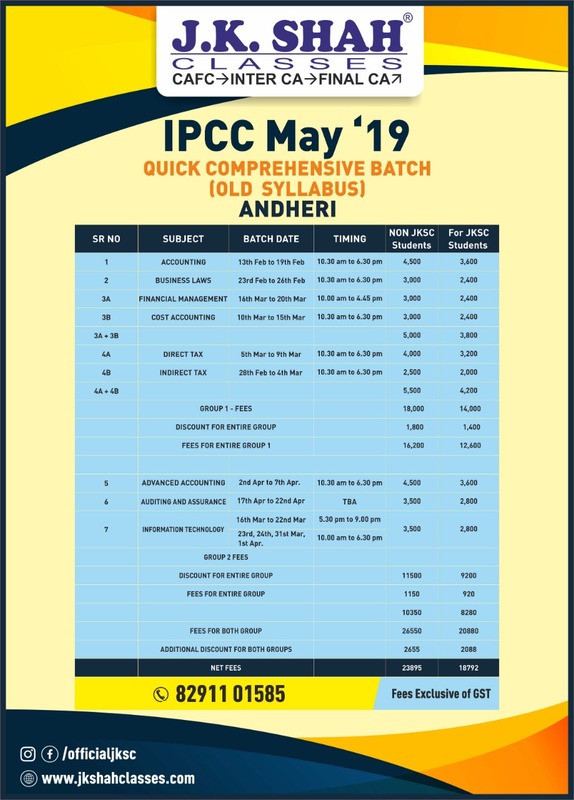 Whether you choose to enter the process through foundation route right after your intermediate (12th standard) or whether you wish to pursue this course through Direct entry after completing your graduation, we have customised courses available for every entry level. Our CA Coaching classes are updated regularly with regards to latest amendments, they are based on practical scenarios and are backed up with vast knowledge of our senior lecturers. Adhering to time schedules, in depth coaching and clarification of topics are the key components that our students benefit from, turning many of them into all Indian rank holders and ultimately successfully becoming Chartered Accountants. We give ample and appropriate time period to prepare for CA CPT Entrance level exam. After successful completion of this level, we provide the required 4 weeks of ICITSS training along with preparation for CA IPCC exam. Both levels are very difficult to prepare for, but our staff and faculty make sure that the entire batch keeps up with the course curriculum and passes both the groups with flying colours. Articleship training is an important aspect before becoming a CA, and J.K. Shah Classes impart Articleship Induction Program for the mandatory 2 and half years of articleship training. We help in getting in to the articleship program along with continued preparation for the final exam. This is a long period of time but we do not leave our students distracted and keep them regularly in touch with the course curriculum and AICITSS training.